The Ultimate Wipes Warmer The Ultimate Wipes Warmer takes the chill out of diaper changing! Featuring the patented Ever-Fresh System, the Ultimate Wipes Warmer keeps baby wipes fresh, moist and free from discoloration. The Ultimate Wipes Warmer is the ONLY wipes warmer molded with an EPA-approved anti-microbial additive to inhibit the growth of bacteria and microorganisms. Advanced moisture retention system and insulated body keep baby wipes warm and moist. Push button pop-up lid allows for safer, one-handed dispensing. Warms both pop-up and regular wipes to the perfect temperature. Moisture Retention The Ever-Fresh pillow keeps wipes moist by an evaporation and condensation process. Micropores in the pillow trap and release water as needed to maintain wipes’ moisture content. Non-Browning Keeping wipes moist prevents most discoloration caused when wipes are warmed. Discoloration also occurs when aloe, lotions and other additives typically found in baby wipes are warmed over time. The Ever-Fresh pillow effectively insulates your wipes from the warming surface, preventing browning. Anti-Microbial Both the Ultimate Wipes Warmer’s tub and the Ever-Fresh pillow are treated with an EPA approved additive to inhibit the growth of microorganisms that may cause spoilage, odors and mildew. Specially designed micropore pillow that fits between the heat source and wipes, keeping wipes moist and fresh! Replace Ever-Fresh TM every three months to keep wipes moist and fresh! The Complete Diaper Changing Station™! Designed to make diaper changing safer, quicker and more convenient by providing everything at your fingertips. The unique three-in-one changing station attaches to most changing tables. The roomy bottom compartment holds 16-18 large cloth or disposable diapers. 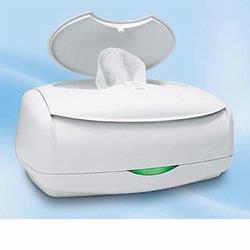 Baby Wipes sit on flat tray and the two removable side bins hold ointments, powders, lotions and more! Top tray not only holds regular Baby Wipes, but is designed to accommodate our NEW Ultimate Wipes Warmer™ with the Ever-Fresh System™.